C. Giacovazzo, E. Dodson, G.M. Sheldrick. The ninth Ewald Prize has been awarded to Professor E. Dodson (Department of Chemistry, University of York, UK), Professor C. Giacovazzo (Institute of Crystallography - CNR, Bari, Italy) and Professor G.M. Sheldrick (Lehrstuhl für Strukturchemie, Göttingen, Germany) for the enormous impact they have made on structural crystallography through the development of new methods that have then been made available to users as constantly maintained and extended software. 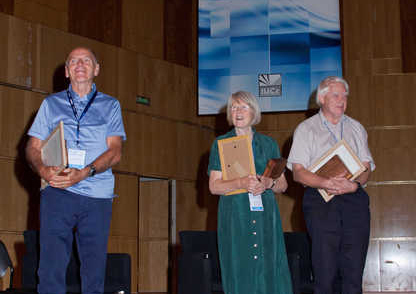 Their invaluable contributions to computational crystallography have resulted in the leading program suites CCP4, SIR and SHELX, respectively. All over the world thousands of crystallographers benefit from their achievements on a daily basis. The presentation of the Ewald Prize was made during the Madrid Congress Opening Ceremony on 22 August 2011. For a list of papers by Professor Dodson appearing in IUCr journals click here. For a list of papers by Professor Giacovazzo appearing in IUCr journals click here. For a list of papers by Professor Sheldrick appearing in IUCr journals click here.